Well, today has been a l-o-n-g day of photography. I spent the night at the Downtown Hotel in Dawson City, had a 6:00 AM breakfast and was on the road before 7 in order to get to a beaver pond by 8:30 to record their winter preparations before they went to sleep for the day. That’s when we encountered our first frustration. The pond was lightly frozen over (remember, today is August 31!) with a few small holes indicating where the beavers had recently surfaced, but there were no signs of the beaver families. Strike one. However, we did take some landscape images at the pond, so it was not a total waste. We continued to the Tombstone valley overlook, which I had eagerly anticipated because that would be the first time on this trip that I’d get to use my 4x5 view camera. 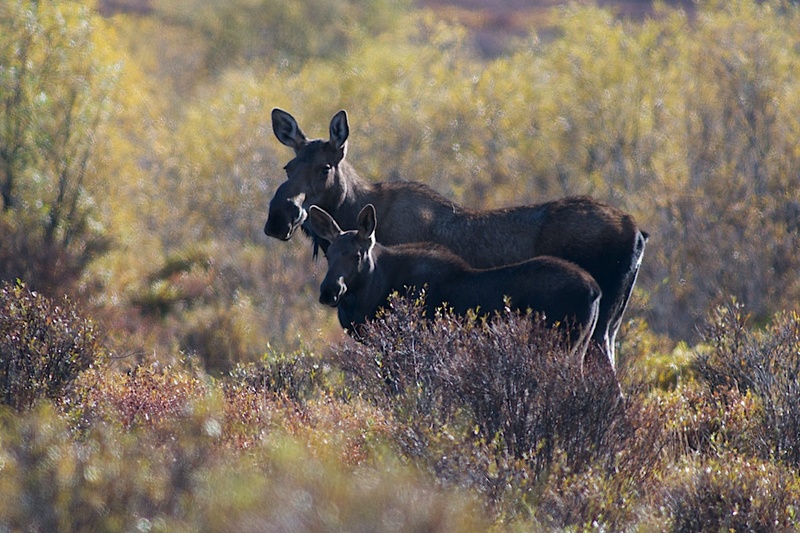 The day was crisp and clear, the sun was shining, but there was nary a cloud in the sky and the tundra plants had not yet turned into their Fall colors due to the enormous amounts of rain in the Yukon over this summer. The vista, which is normally strikingly rich, with lots of depth, was flat and uninteresting. I never even set up my camera. Strike two. With two strikes against us, we were eager to hit some home runs… and we did. As we drove due north, we managed some interesting landscape images. We also stopped at Two Moose Pond, not expecting to find any moose, since a few weeks ago a group of First Nations hunters had shot two moose at the pond, in front of shocked tourists. We hung around taking some landscape images, and suddenly, there was a cow and calf in the distance, the first to repopulate the lush pond environment. Unfortunately we weren’t able to get close, but I did manage a few shots using a Nikkor 500mm lens and 1.4 teleconverter on a Nikon D300 body. Later we spotted a black bear with a light coat, which the locals call a cinnamon bear. We followed it for a bit, but noticed that he was stressed and wanted us gone. 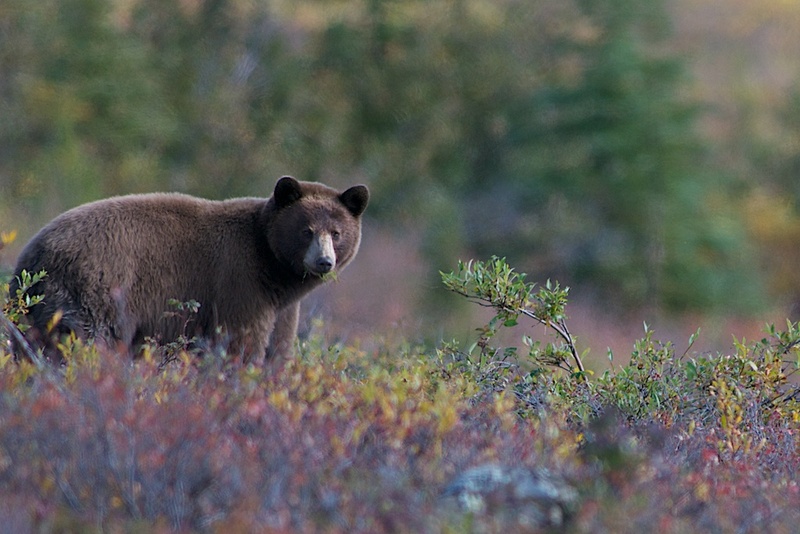 We quickly complied, as black bears are generally more aggressive than grizzlies. 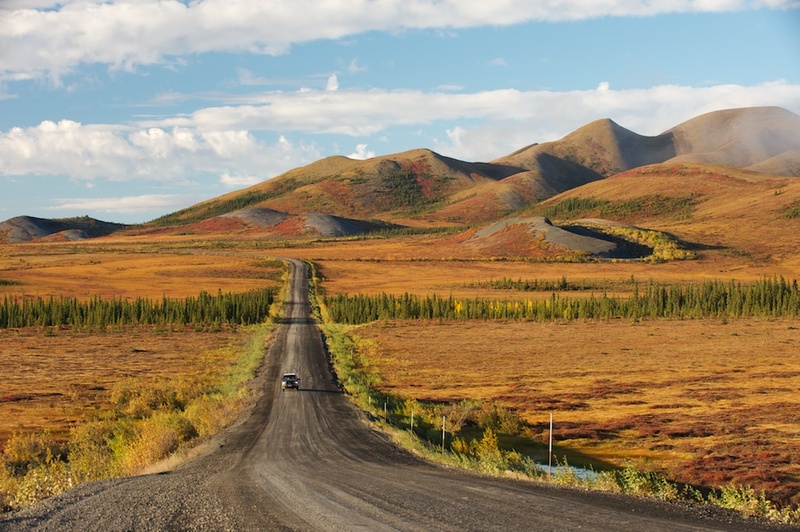 The temperatures reached 62F, an absolutely sweltering day in the Yukon at this time of year. We continued up the rutted, gravel-and-dirt road, stopping every so often for more images. But the time was getting away from us, so we made a pact to not stop unless both of us declared it a strikingly, amazingly, impossible-to-pass-up photo opp. Of course that occurred every kilometer or two. We had no time for lunch. Then again there is only one commercial establishment on the Dempster and we were hours away by mid afternoon. We finally rolled into Eagle Plains, checked into the only motel/restaurant and had dinner around 5. 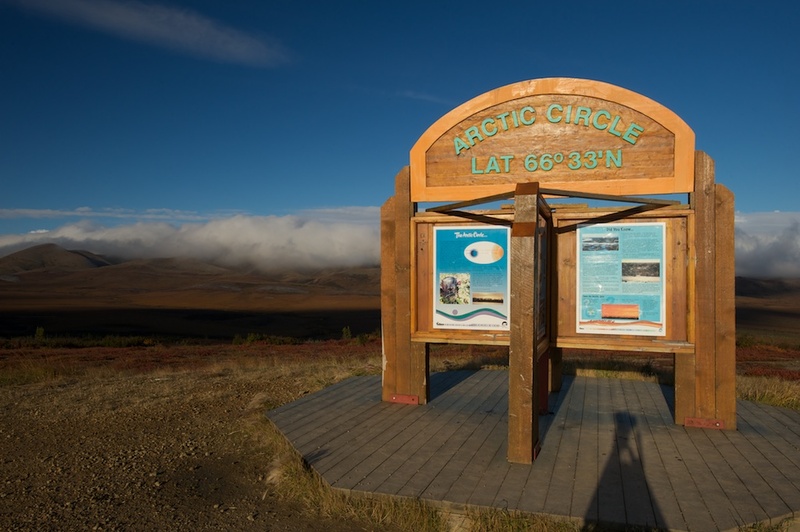 In 30 minutes we headed north again for the Arctic Circle and the North West Territory border, we there had been numerous grizzly sightings during the day. Strike three on that score, but we did encounter one of the most unusual weather phenomenon I’ve ever seen. If any of you readers know anything about this, please add your comment to this blog. 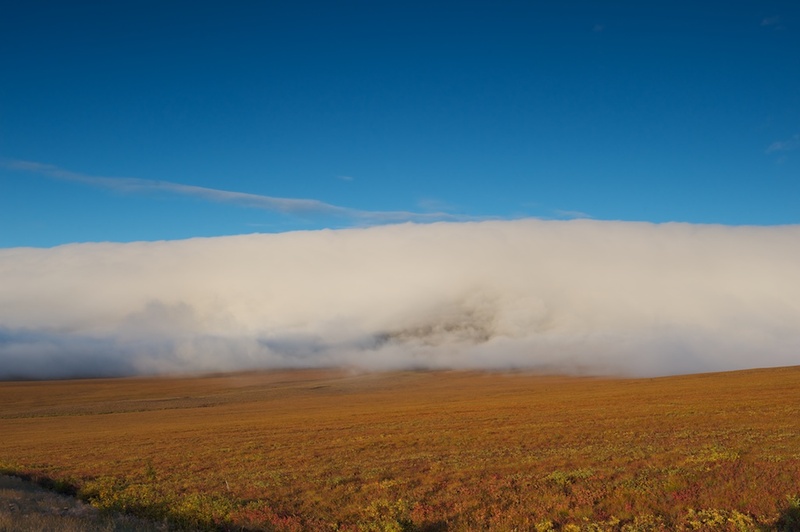 Stretched across the open tundra landscape was a wall of cloud like none other in my experience. It was a dense roll, an immense wall, almost frightening in its beauty. This band did not move, but changed shape as we watched. From below the cloud, dense fog spewed out in regular waves, carrying with it high winds. The winds buffeted our SUV and we finally made it to the North West Territory border where we could hardly see a hundred feet in front of us. The wind at this point was howling. 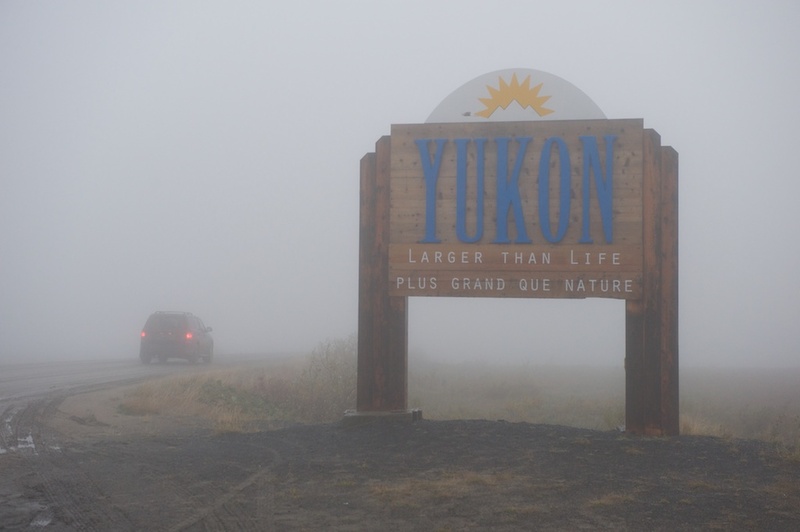 As we turned around, we snapped a few pictures of the Welcome to the Yukon sign. Perhaps ten kilometers down the road the sun began to set and we pulled over, still in high winds, to record it. 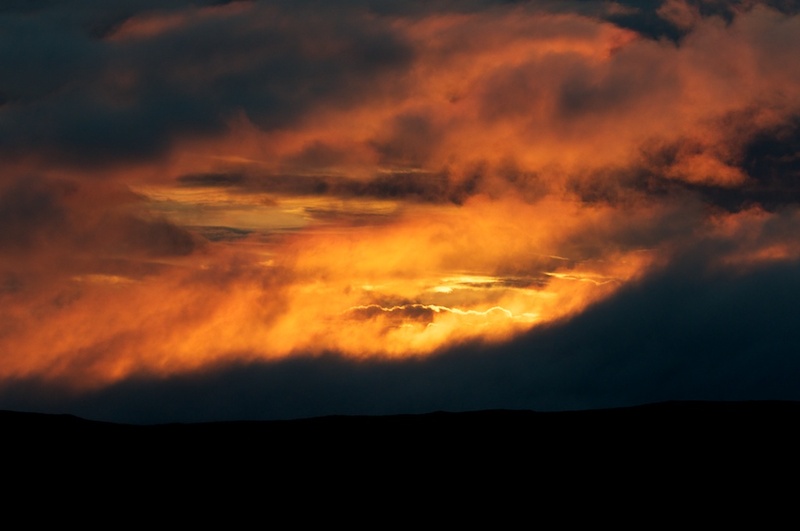 The only way to describe what we witnessed was to use the trite expression that the sky was on fire. You judge for yourself from this next image- straight out of my camera and untouched- how accurate that description was. This image was from just one portion of the sky. By now it was after 10:00 PM and we doubled back to the Eagle Plains Motel, rolling in around midnight, utterly exhausted, but thrilled by a full day of photographing our natural world in all its glory.